This luxury Mykonos villa just 150m from the sea is located in the region of Kanalia, a little further away from Ornos region which is close to Mykonos Town. The villa has a panoramic view of Mykonos Town, Little Venice, the ports of Mykonos and the superb island of Tinos. From this location you have an easy access to services, shops, Ornos beaches, Psarou beach and Plati Gialos beach while being in a residential and calm area of Mykonos. The villa is well furnished and nicely designed with Mykonian colors used in a minimal way as it has always been in the Cyclades. The main floor consists of the living area, the dining room and the equipped kitchen. Windows view are toward the pool area, the sea and Mykonos Town. From this floor you have a direct access to the pool and the shaded veranda with its furniture. You will probably pass most of your time between the pool and the outdoor dining area, enjoying lazy breakfasts, cold drinks and nice Mediterranean food. On the same level you will find the guest house with a double size bed, a living area and the bathroom. The upper floor has the other 2 bedrooms, each one with a double size bed and bathrooms. 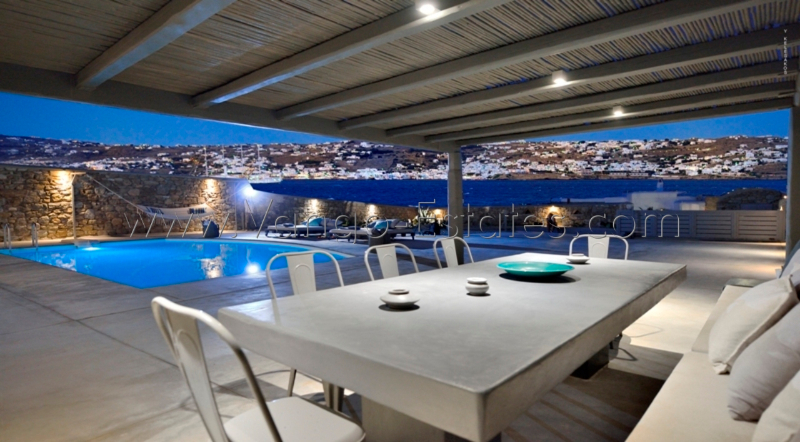 Your choice for this villa should be based on the nice decoration, the superb view over the sea and on Mykonos town, the services provided and the fact that you are well positioned, very close to Ornos village with its services, shops and restaurants, close to Mykonos town and its activity. The villa is sea front, which is becoming rare. As Kanalia region is residential, property is suitable for all kinds of group composition, friends, couples or family. The villa is on a plot of 1000 sqm for a total living area (indoor) of 147m2 on 2 floors + an independent guest house (total of 3 bedrooms). The pool is 35m2. We manage adjacent villas, for bigger groups please advise us and we will send you quotes and offers.